Candida diets limit the intake of foods thought to serve as nutrition sources for candida, a type of yeast that occurs naturally on the skin and in the digestive and reproductive tracts. Excess candida in the body, a condition known as candidiasis, is believed by some practitioners of alternative medicine to cause bloating, fatigue, headaches, muscle pain, premenstrual syndrome and depression. Restricted foods on a candida diet include processed products and refined carbohydrates. With some careful planning, a vegan can follow most of the diet's guidelines, though it's best to consult a doctor before beginning. Not all medical experts, including the American Academy of Allergy, Asthma and Immunology, agree that candidiasis is a disease, or that it can be treated with a special diet. Soy products such as tempeh, tofu and texturized vegetable protein, or TVP, are a vegan's best protein choices on a candida diet. Although beans and legumes typically make up the bulk of the average vegan's meals, those on a candida diet will need to limit themselves to 1 cooked cup each day, supposedly to limit the amount of carbohydrates available to the candida. Nuts and seeds such as almonds, cashews, sunflower seeds, walnuts and pecans are allowed, but pistachios and peanuts should be avoided. The best carbohydrate sources for a vegan on a candida diet are fresh fruits and vegetables, since no type of grain, either refined or whole, is permitted. Choose fresh or frozen unsweetened fruit and nonstarchy vegetables such as asparagus, lettuce greens, eggplant, cucumber, cabbage, carrots, broccoli, onions, spinach and tomatoes. Dried fruit such as raisins, fruit juice and high-starch vegetables such as potatoes, yams and corn should be avoided since they cause the concentration of simple sugars in the blood to rise. Mushrooms are also not allowed, as they allegedly react harmfully with candida. Individuals on a candida diet are usually advised to eat plain, unsweetened cow, goat or sheep yogurt that contains live Lactobacillus acidophilus cultures to help control the growth of candida. Vegans cannot substitute commercial soy yogurt because it contains sweeteners such as honey, agave syrup and amazake. 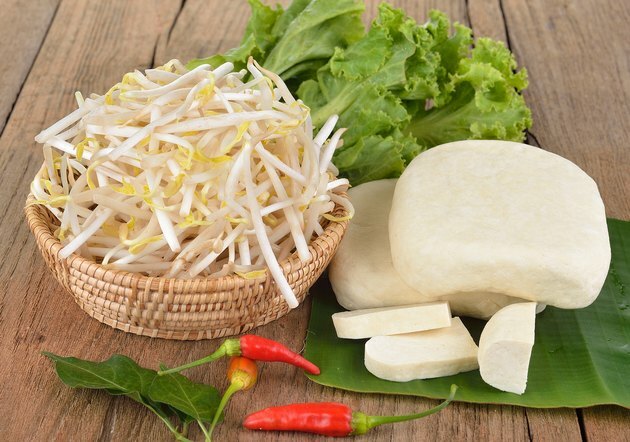 According to the Functional Medicine Research Center, vegans can obtain the calcium their bodies need to build and repair their bones and teeth by choosing acceptable brands of soy milk and soy cheese. Soy milk should not include sweeteners such as brown rice syrup, and allowed soy cheeses should not contain modified food starch or maltodextrin. Vegans can cook with vegetable oils such as olive, canola, almond, avocado, sesame and flax seed. All low-sodium, sugar-free herbs, spices and seasoning mixes can be used to prepare and flavor food, along with freshly squeezed lemon and lime juice. Vinegar and any other type of fermented or pickled foods, such as kimchee and sauerkraut, should be avoided since they are thought to serve as a food source for candida. If you want to use an artificial sweetener for your herbal tea -- you should avoid coffee and regular tea -- use stevia.